One of the feel-good stories for the Texas Rangers this season would be if local star Michael Choice makes the team and only has to make a 15-minute commute from where he grew up to work. That story loses some of its luster if Choice is playing for Triple-A Round Rock. Choice, 24, is doing all he can this spring to make sure the feel-good story happens. The outfielder, who was acquired from Oakland last December as part of a deal for Craig Gentry and Josh Lindblom, is making a strong impression this spring the same way he did as a high schooler at Mansfield Timberview and collegiately at the University of Texas-Arlington. Choice, trying to win a spot as the fourth outfielder and part-time designated hitter, came into Wednesday’s game hitting .364 on the spring in his bid to make the Opening Day roster for the first time. "Barrels the ball up, right center, left center, good approach," Texas manager Ron Washington said in his assessment of Choice. "He’s getting better in the outfield with Gary (Pettis) too so he’s been doing well. Do it as Michael Choice. Don’t try to do it as being an impressionist. The game just doesn’t come together when you try to do that. Do it like Michael Choice and everything will be fine." Everything’s been fine for Choice for a while. He was the Southland Conference player of the year at UTA in 2010 and is the program’s all-time leader in home runs. He was the 10th pick in the 2010 draft by Oakland and hit .302 in Triple A last year before getting called up by the Athletics to play in nine games late in the season. When the Rangers traded for Choice, he had the inside track on a starting outfield spot. 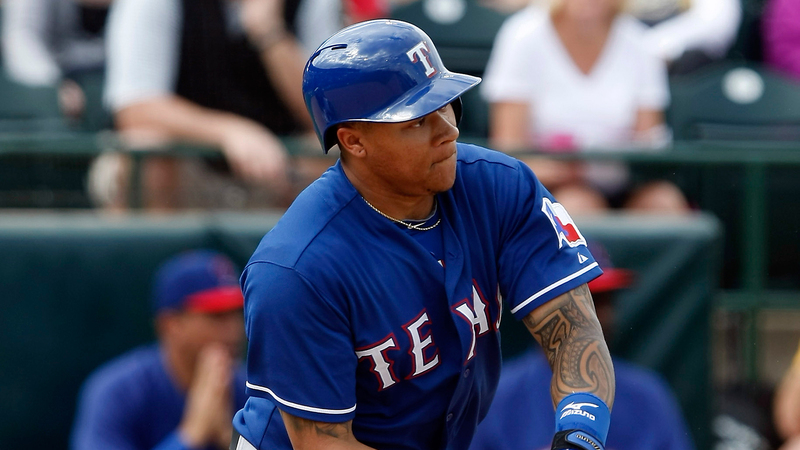 But that was before the acquisition of Shin-Soo Choo, which filled the starting outfield out. Now Choice is in a battle with Engel Beltre, who is out of options, and Jim Adduci for a backup spot. "It’s still early," Choice said. "You never know what’s going to happen. There are a lot of guys here who can fill that void. My focus stays the same regardless of who is around me." That’s just the kind of attitude the Rangers have seen from Choice this spring. "We’ve been impressed with the way he’s come in and gotten after it," Texas general manager Jon Daniels said. "Playing like a guy who wants to win a job, not just make the club. Swing and defense have both been very good." Choice’s focus is on sticking in the majors, even it limits his playing time. The fact that he’s the only right-handed option of the remaining outfielders could help if the team wants someone to platoon with Mitch Moreland at DH. Washington said that he doesn’t like young players to sit around and be the designated hitter because he feels like they need to play every day. Choice is hoping to change that opinion. "I’ve been a DH plenty of times in the minor leagues," said Choice. "It wouldn’t be the first time. I did a lot of DHing in the fall league. I don’t think I’m a guy who needs to be in the field to be productive." Choice, who was Oakland’s minor league player of the year last season, believes he’s proven himself in the minors. Now he wants to do so in the majors, even if that is in a part-time role for now. He’s already shown his outfield versatility this spring, as he’s seen action in left field, center and right. Now his goal is to stick in Arlington, which is where he still lives. "No guy grew up as a kid wanting to play Triple A baseball," Choice said. "Everybody wants to be in the big leagues regardless of what your role is. At this point playing more isn’t my focus, it’s helping the big-league club win. That’s my focus." He’s certainly got a lot of people pulling for him in Texas, where they have no doubts about Choice’s ability. UTA has had a pipeline to the Rangers with Ryan Roberts and Mark Lowe each making stops at Globe Life Park in recent years. Neither of those players though had the kind of success before getting to the majors that Choice did. Now it’s up to him to see if he can make the hometown dream come true. "He’s definitely succeeded at every level of college and pro ball, and he also has all the physical tools to do it," said UTA head coach Darin Thomas. "It’s a matter of what kind of spring training he has and how comfortable he is, but all the intangibles are there."